Messaging with iOS devices are typically carried out either through cellular data or wireless (Wi-Fi) network. You can select which messaging service to use on your iPhone according to your preferences. SMS and MMS messages you send over cellular network will be counted on your account’s text messaging plan with your carrier but over iMessage will not. For starters, iMessage is Apple’s patented messaging service used mainly for exchanging text and multimedia messages between iOS and Mac devices through a Wi-Fi network. These services are deemed among the most significant offers of the sophisticated iOS and Mac devices. Needless to say, your iPhone or Mac experience is not complete with these services not working on your device. But considering the presence of various factors triggering system inconsistencies and downtimes, random issues are inevitable. Even the highest-tiered iPhones can knuckle under these problems. On the Internet, you can see a rising number of complaints raised by iPhone 7 owners regarding various types of messaging problems using the standard messaging app and iMessage. If you are one of these people facing similar dilemmas on the same iOS device, you always have to option to fix the problem yourself. Feel free to use this content as your reference on which workarounds to try on your end. Read on to find out why you cannot send or receive messages on your iPhone 7 over cellular data or Wi-Fi, using the standard messaging (Messages) app or iMessage. For those who have other issues, however, make sure you drop by our iPhone 7 troubleshooting page for we support this device and we provide free support to our readers. You can always contact us by completing our iPhone issues questionnaire and providing us with sufficient information about your problem. Network errors and downtimes are the most common culprit. Network services disruptions are inevitable on either cellular connection or Wi-Fi network, regardless of how reliable your network provider claims to be. If the network connection is not stable, you will likely encounter errors in getting or message are not delivered. The same thing can happen without a network connection available. Incorrect network settings or misconfigured options like disabled Wi-Fi or Cellular Data is also a possible cause. Among other factors to consider are invalid recipient or incorrect phone number or email addressed enter for recipient, faulty or damaged SIM card, and type of message not supported by your carrier. There are some types of messages which your carrier does not support. Contact your carrier for further information about their scope of support for messages. It is imperative to determine all possible underlying causes so as to have an idea on which settings to check and what needs to work on your device. How to deal with messaging issues on your iPhone 7? Highlighted below are generic solutions and suggested workarounds used to deal with various messaging problems on the new iPhone 7. Solutions may vary depending on which of the aforementioned factors has caused you an issue with sending or receiving messages. If you could not determine which exactly is halting you from sending or receiving a message, then you can try all of the subsequent methods. Try to create a test message after completing each step to see if that has fixed the problem. If you’re still unable to send or receive your test message, then try other workarounds available. Note: To save time and effort in troubleshooting, try to isolate the problem as much as possible. The easiest way to do so is to think of what has happened before the onset of the very first symptom. For example, did the problem start after making some changes to your iPhone settings? If so, then try to revert the changes or go back to the previous settings before the problem started. What to do first if you cannot send or receive messages on your iPhone 7? Consider the following possibilities before you begin troubleshooting. Network outages can happen anytime, scheduled or unexpected. You should consider this among the possible culprits especially if the problem happens all of a sudden without making any changes on your device settings. You may contact either your carrier or Internet Service Provider to check on any on-going system maintenance that may have affected network services, particularly messaging services in your area. If an outage is present, then all you need is to wait until it’s over. Services should resume afterwards. You can ask your carrier or ISP for an estimated timeframe as to when messaging services would resume so you’ll have a heads up on when to try again. Other accompanied issues to arise from network outages include no connectivity, resulting to inability to make or receive calls, as well as unable to browse or connect to the Internet. Step 2. Verify Wi-Fi/Cellular Data settings. Messaging on your iPhone requires either Wi-Fi or Cellular Data network. You will need an active connection to a Wi-Fi or wireless network in order to send/receive messages using iMessage. For standard SMS or MMS messaging, an active Cellular Data connection is necessary for the service to work. So you better check and verify if Wi-Fi or Cellular Data is enabled on your iPhone. If you are using Wi-Fi or iMessage, enable Wi-Fi on your iPhone 7 by going to Settings-> Wi-Fi-> turn on the Wi-Fi switch to enable the feature. Doing so will prompt you with a list of available wireless networks. To join or connect to a network, tap the name of your preferred network. If you’re attempting to connect to a secured network, you will be required to enter the correct password to proceed. If you are using Cellular Data or standard messaging via Messages app, enable Cellular Data on your iPhone 7 by going to Settings-> Cellular-> Cellular Data (Mobile Data). Note: Menu options may vary slightly depending on your carrier and device model. You may also need to set up your iPhone 7 for data roaming especially if you cannot send or receive messages while traveling internationally. To do so, go to Settings-> Cellular-> Cellular Data Options-> Data Roaming Settings-> Cellular-> Cellular Data Options-> Data Roaming. Make sure data roaming option is enabled. Step 3. Check memory status. While this isn’t likely an issue given that what you have is a new iPhone that sports higher storage capacity, it wouldn’t hurt to check and make sure everything is good with your iPhone’s memory status. To check memory status of your iPhone 7, go to Settings-> General-> Storage & iCloud Usage. From the storage section, check the details for Used and Available memory on your device. To view total storage and available storage for iCloud, go to the iCloud section. You can clear cache memory that is being used by your iPhone quickly by performing a soft reset or turning your device off and then back on. To free up more space, delete any unused items such as unnecessary apps, music, messages, photos or videos from your iPhone. Step 4. Check your account status. You may not be able to send messages over Cellular Data if your account status is disabled. Disabled accounts are usually those that are having unsettled balances or other accounts issues with your carrier. Contact your carrier to verify your account status and make sure there are no restrictions imposed on any of your account services. For example, some carriers would impose a temporary disconnection or soft disconnect to accounts with unpaid balances. As a result, outgoing services are restricted. So make sure this is not causing you trouble in sending messages on your iPhone. Step 5. Check and manage your blocked list. Messages will not be delivered to block-listed contacts or phone numbers. If you cannot send a message to a specific contact, make sure that the phone number or email address for the recipient is not listed in your blocked list. Remove it from the blocked list, if necessary. To check and manage blocked list on your iPhone 7, go to Settings-> Messages-> Blocked. From the next screen, you can add or unblock contacts or phone numbers. To unblock a contact, tap Edit on the upper-right corner of the screen, tap the minus (–) icon, then tap Unblock. After unblocking the number, try to send a message again. Step 6. Verify MMS messaging settings. MMS messaging option must be enabled on your iPhone in order to send and receive MMS with the Messages app. To check if this option is enabled, go to Settings-> Messages-> MMS messaging. If you don’t see this option on your Messages settings, contact your carrier for more information. It is possible that MMS messaging is not supported in your account and if so, you need to have the service activated by your carrier. Step 7. Check the date and time on your iPhone. There are some instances when you’ll be prompted with a “Waiting for activation” error while attempting to send a message on your iPhone. If this happens to you, check the date and time settings on your iPhone and make sure they are configured properly. To check and manage date and time settings on your iPhone 7, go to Settings-> General-> Date & time-> then tap the option to Set Automatically. Automatic date and time settings are then applied on your device. The date and time on your iPhone will then be based on your time zone. After you configure the date and time settings, go back to Settings-> Messages-> turn iMessage off and then back on. 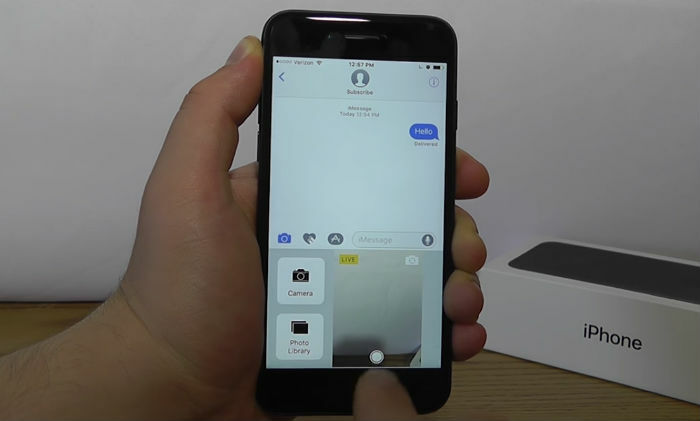 This trick has been used by and able to help other iPhone users who were dealing with problems on sending or receiving iMessages on their iPhone devices so you might as well give it a try on your end and see what happens. Continue trying any of the following workarounds if the problem remains after verifying everything mentioned above. Don’t forget to perform a test message after performing every method so as to determine whether the problem has already been fixed. Try other methods if necessary. Step 1. Quit and restart Messages app. Minor software glitches affecting the Messages app function can be resolved by quitting and restarting the app. This method can also help fix corrupt files, which might have affected the Messages app’s functionality. Give this workaround a try on your end and see what happens. Step 2. Reboot/restart/soft reset your iPhone 7. This is by far the simplest method but most efficient when it comes to fixing device issues triggered by minor software inconsistencies or system glitches. It also helps free up space on your device memory storage. To restart your iPhone 7, press and hold the Sleep/Wake button for at least 10 seconds until the red slider shows up. Drag the slider to power off the device completely. Wait for 30 seconds, then press and hold the Sleep/Wake button again until the Apple logo appears. Your iPhone will now reboot. After the reboot, open the Messages app and perform a test message. Alternatively, you can force your iPhone 7 to restart especially if you are unable to send or receive messages and that the Messages app became unresponsive. To force restart your iPhone 7, press and hold the Sleep/Wake button and Volume Down key simultaneously, for at least 10 seconds until the Apple logo appears. Both methods won’t erase any information from your device, thus they’re safe. Step 3. Verify and ensure iMessage is properly set up. You will not be able to send or receive iMessage if iMessage service is not properly set up on your iPhone 7 in the first place. If you’re not sure if iMessage is set up on your device or not, try to check by going to Settings->Messages->Send & Receive. You will then see a list of phone numbers and email addresses that are configured to send and receive iMessages on your iPhone. An empty list will show if you haven’t yet configured any phone number or email addresses on your device. Go to the “Start New Conversations From” section then mark the checkbox next to your current phone number. To activate iMessage for your number, tap on your phone number. If necessary, enter your new phone number first and then select it for use in the Start New Conversations From section. Step 4. Delete and create a new thread/conversation. Deleting the existing thread or conversation can also help eliminate any messaging glitches that’s causing you trouble in sending or receiving messages. To do so, open the Messages app, swipe left over the desired conversation, then tap Delete. Close the Messages app afterwards. After a few seconds, open Messages app again then create a new thread or conversation by tapping the Create New Message icon. Enter details for recipient(s), compose your message. Finally, tap the Send icon to send your message. If the message is not delivered and you see a red exclamation mark, tap on the red exclamation mark and then select Try Again. Doing so will resend the message. If that won’t work either, try to tap the red exclamation mark again and then select the option to Send as Text Message. Step 5. Remove and re-install SIM card. A bad or improperly installed SIM card can also cause you the same trouble sending or receiving messages. Usually, you will see an error prompt saying SIM card error, No SIM card, or other relevant error prompts. To fix the problem, try to remove the SIM card from the tray and the re-install it properly. Be sure to power off your iPhone completely before you remove the SIM card. Also, you will need a SIM tray ejector or paper clip to pop the SIM tray out. After re-installing the SIM card, turn on your device and then check to see of messaging service is already working fine. Step 6. Update carrier settings. Carrier settings updates generally contain add-ons and new system implementations from your carrier or service provider. To ensure that all new settings or carrier updates are implemented, check your iPhone for available updates. If there is, proceed with update download and installation. To do so, go to Settings-> General->About-> Carrier Settings. Follow the onscreen instructions to complete the carrier settings update download and installation process. Carrier settings installation can be optional or mandatory. Step 7. Reset network settings on your iPhone 7. If you start having trouble sending or receiving messages after making some changes to your iPhone 7’s network settings, then try to change the settings back to its original configuration before the problem instigates. However, if you are not sure of which settings or options to configure, resetting the network settings back to its factory defaults might be necessary. Although you have to note that performing a network settings reset would likewise erase all your network information including your Wi-Fi password and other credentials. Thus, you should take note of this information before you begin so as to recover them easily afterwards. Once everything is all set, you may go ahead and go to Settings-> General-> Reset-> select the option to Reset Network Settings. After the network reset, reboot your iPhone, open the Messages app then create a test message to see if messaging is already working fine. Step 8. Update iPhone 7 iOS. Sometimes, the problem may not be able to get resolved especially if major software bug is to blame. In cases like this, installing an iOS update that contains a fix patch for existing bugs and glitches might be the only solution you need. Your iPhone 7 is originally running on iOS 10. Apple has rolled out some minor updates like the latest iOS 10.3, so you can try updating your iOS by going to Settings-> General-> Software Update. Now give a test message one more try and see what happens. If problem persists, then consider the next suggestion. You have done all the recommended procedures, checked and verified your account status and everything on your messaging app , yet you still cannot send or receive messages on your iPhone 7. If so, then I suggest you should now contact Apple Support for further assistance and other options. If you have other issues with your Apple iPhone 7, we are always willing to help. Contact us through our iPhone issues questionnaire and provide us with all necessary information about your problem so we can find a solution to your issue.